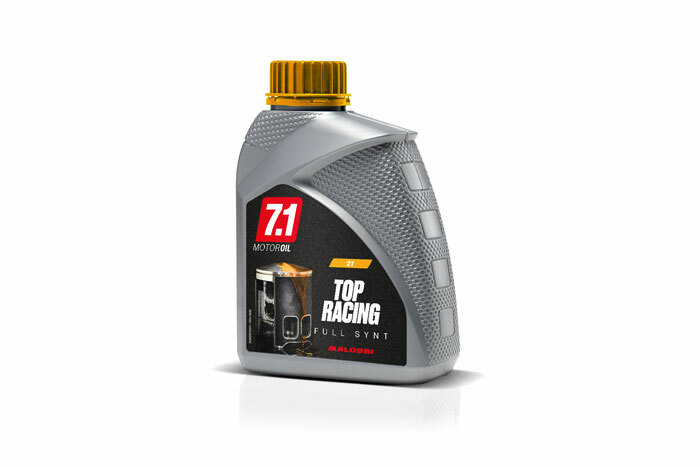 Developed exclusively for racing 2-stroke engines, 7.1 TOP RACING is formulated using synthetic esters that ensure exceptional anti-wear properties, reducing internal friction and guaranteeing consistent performance over time. 7.1 TOP RACING ensures superior load-resistance and cleanliness characteristics for racing engines, requirements necessary for the full development of power even with very rich oil-gasoline (oil-petrol) blends. 7.1 TOP RACING is particularly resistant to sticking piston rings and the formation of residues on spark plugs, to help the engine to develop maximum power for the whole duration of the race. The product forms a tough fi lm between the cylinder, piston and piston ring, prolonging the life of the engine. It can be mixed with any type of gasoline (petrol), in every season of the year, without any problem of mixing and stability of the mixture.